Los Angeles – Following three days of volatility after China’s surprising interest rate increase on Tuesday, gold bullion prices moved to $1,328.50 an ounce on Friday while silver improved to $23.30 an ounce. The price of gold reached an all-time record high of $1,387 an ounce on the 14th of October and has gained 21 percent a year to date. The week began with Fed Chairman Bernanke signaling that the Fed is prepared to ease monetary policy once again. More quantitative easing “is a form of risk management — an insurance policy that is prudent to put in place at this time,” Atlanta Federal Reserve President Dennis Lockhart said on Monday to the Savannah Rotary Club. Since taking office in January 2009, Geithner has seen the dollar lose 10 percent of its value against the world’s other leading currencies, and he has seen it give up more than 33 percent of its value to gold as well. 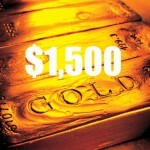 Analysts remain bullish on the price of gold and continue to call for a gold price of from $1,400 to $1,500 by year’s end. “I am still predicting $1,400 by the end of the year,” said Mark Pervan, senior commodities analyst at ANZ in Melbourne, adding that physical demand from India and China was expected to continue to support gold bullion prices. “The recent tightening announcement by China has sort of taken the market a bit by surprise. But (it) doesn’t derail the weak U.S. dollar story and probably strong Chinese demand story.” Several banking institutions have raised their forecasts for the gold price and the latest firm to do so is Scotia Capital, as analyst David Christie predicts the gold price will reach $1,500 and the price of silver will reach $25 per ounce by year’s end.